Butterfly farming and rearing supplies. Find all the pop-up cages and rearing items you need to breed and rear butterflies and other insects. Watch the wonders of the natural world right inside your home. We offer many different supplies to choose from. From pop-ups to microscope slides we have what you need to grow and rear butterflies from eggs to adults. 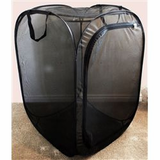 Butterfly Popup Cage without vinyl window Black 24" by 24" by 36"
Butterfly Popup Cage without Vinyl Window Black 12"x12"x12"
Butterfly Popup Cage with Vinyl Window Black 13.5" by 13.5" by 24"